My family has been making this mocha fudge pie each holiday for years now. The recipe comes from Cooking Light and it isn't exactly light, but it's not calorie-laden like a cheesecake either. Each serving has 297 calories. 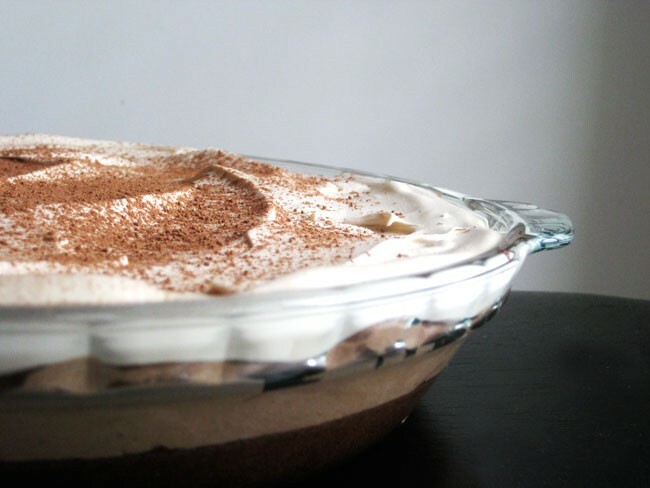 The pie consists of three layers: a brownie crust, a creamy chocolate pudding mocha layer, and then a coffee whipped cream layer. It's delicious. It really is. You'll be tempted to eat the filling layers as you go. Go ahead and lick the spatulas and bowls when you're done. Combine hot water and 2 teaspoons coffee granules in a bowl; stir well. Add 2 cups brownie mix, 1 teaspoon vanilla, and egg whites; stir until well-blended. Pour mixture into a 9-inch pie plate coated with cooking spray. Bake at 325° for 22 minutes (brownie will be fudgy when tested with a wooden pick). Let cool completely on a wire rack. Combine milk, 2 tablespoons Kahlúa, 1 teaspoon coffee granules, 1 teaspoon vanilla, and pudding mix in a bowl; beat at medium speed of a mixer 30 seconds. Gently fold in 1 1/2 cups whipped topping. Spoon pudding mixture into brownie crust; spread evenly. Combine 1 tablespoon Kahlúa and 1 teaspoon coffee granules in a bowl; stir well. Gently fold in 1 1/2 cups whipped topping. Spread whipped topping mixture evenly over pudding mixture. Garnish with chocolate curls or cocoa powder, if desired. Serve immediately or store loosely covered in refrigerator.